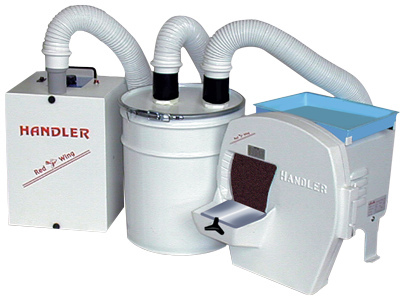 Handler 31DTS Dry Dental Model Trimmer with 10” abrasive disc, 5 gallon cyclone with cartridge filter to trap dust particles for easy disposal. A 62-II super sucker draws a powerful 110 cfm through the cyclone and entraps particles 0.5 microns and larger. Hoses connect the 3 components, dust is removed from the work area and falls into a 5 gallon cyclone cannister.